On the maiden flight of the Flock of Swallows pulled up by a Triangulation Delta... a huge gust of wind came along. I had been sitting on the beach for over an hour holding onto them using a Halo reel. The winds were roughly 24-28 mph and I was getting tired... WHAM! The reel spun out of my hands and bounced along the beach, no way I could have caught them. They hung over Lake Michigan and rose higher and higher, drifting away and eventually became tangled in power lines. 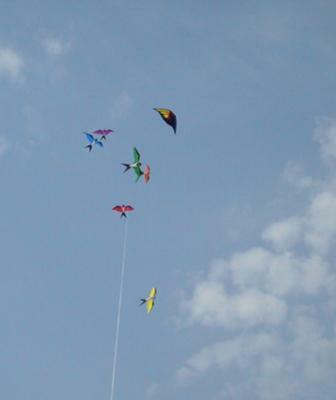 Even when they were "free", the kites were so pretty to watch. Glad to get an interesting, though short, 'kite-loss' tale! Yes, I shifted it here, from the 'pictures of kites' section. It makes a very worthy addition to the other tales of kiting woe. P.S. It's rare that someone in this situation actually gets a decent photo to illustrate the story! Well done.